A year later and the weather couldn’t be more different. This day last year Wicklow was lashed by the Beast from the East. On Wednesday, 28th February 2018, Met Eireann issued a series of weather alerts as blizzard-like conditions swept in and heavy snow blanketed the Garden County. In the days leading up to the cold snap, locals began to prepare, though some had trouble getting their priorities straight. In other news, I just saw a guy drive out of a car wash. In Co. Wicklow. By the start of the week, Wicklow supermarkets had begun to empty of life-sustaining staples – such as… bread. The frigid weather was preceded by a record-breaking sudden stratospheric warming earlier in the month, playing havoc with the polar vortex. The event would disrupt the jet stream before sending a blast of icy air towards Ireland. Ahead of the snow storm, many in County Wicklow, agog at a spell of sunshine as wintry clouds approached, took to social media to question whether or not the predicted #Sneactha would actually transpire. But as the cold set in, people (and animals) hunkered down for the coming blizzard. And on the morning of the Beast’s arrival proper, the prayers of schoolchildren across the county (and not a few adults) were answered. Heavier-than-expected snowfall through the night had pushed Met Eireann into action, prompting the first in a series of Status Red warnings at 5am as heavy snow and wind battered towns across Wicklow. The heavy drifts of snow would gradually swallow everything in sight – including cars. The country’s media descended on Wicklow as the Garden County took the brunt of the falling snow. By week’s end, Glenmacnass registered a snow depth of 69cm – by far the deepest in the country. Sadly, the weather also brought its share of snow-related chaos we’ve come to expect each time a drop of the white stuff appears. 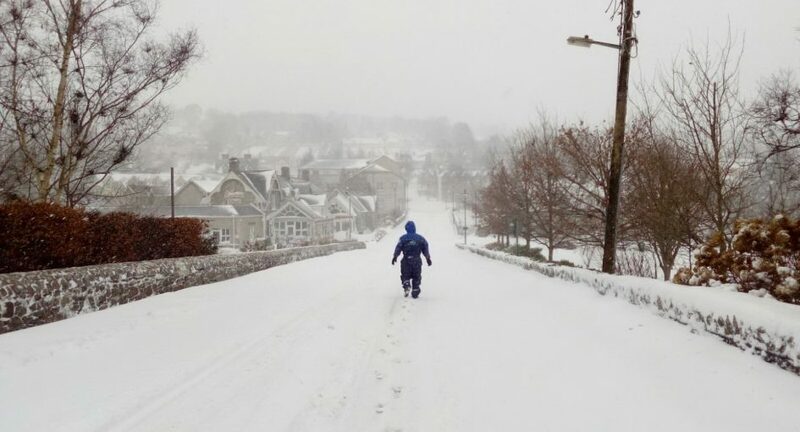 Many areas in Wicklow were cut off for several days as roads became impassable, with the ESB reporting over 100,000 homes and businesses without power nationwide. The conditions saw over 70,000 airline passengers stranded in Ireland due to flight cancellations. Meanwhile elevated areas drew the brunt of the weather, and the Dublin and Wicklow Mountain Rescue Team were forced to issue warnings to ward off “snow tourists” attempting to reach the Sally Gap in 4x4s. The Murrough took its share of onslaught, too. Wicklow’s famous seaside trail has taken a heavy battering in recent years as coastal erosion continues its slow march. This storm was no exception, slicing yards of turf from the receding coastline. The full brunt of Storm Emma, which followed the first days of heavy snow, steadily added to the weather burden. But as the snow stretched into the following week, the white carpet and stormy seas produced stunning vistas of Wicklow’s scenic areas that won’t soon be forgotten.